"Ask her if she knows where she's going." Vertical Entertainment has debuted an official trailer for an indie crime thriller titled The Padre, the latest from filmmaker Jonathan Sobol (A Beginner's Guide to Endings, The Art of the Steal). The plot of this film involves a retired US Judge on the hunt for a con man hiding out as a priest in a small Colombian town. They're getting closer, until a local girl gets in the way with her own plans. The cast includes Tim Roth, Nick Nolte, Luis Guzmán, with Marie Paquim and Ophelia. This doesn't look particularly impressive, but it does have a solid cast at least. From the looks of it, there's some intriguing characters and different threads that all get mixed up together down in Colombia. Check this out. 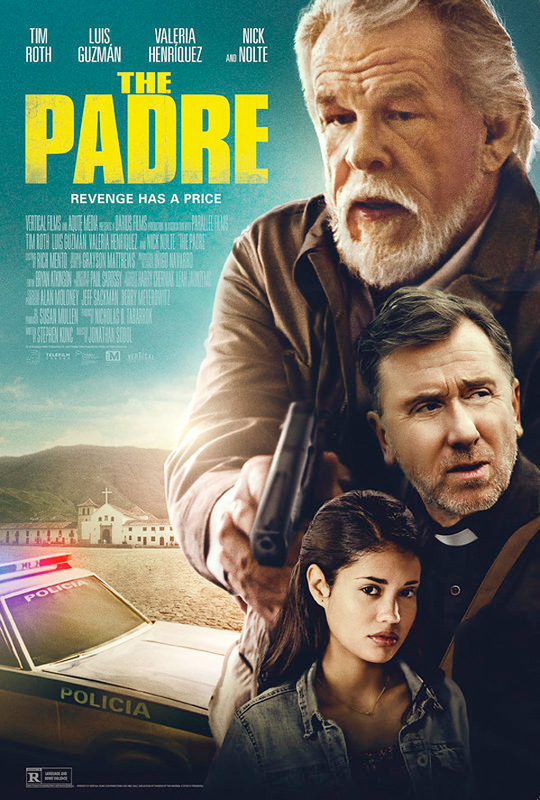 Hell-bent on justice and revenge, retired U.S. Judge Randall Nemes (Nick Nolte) and his hired gun, Gaspar (Luis Guzmán), track down a small-time con man (Tim Roth) posing as a priest in a small Colombian town only to be thrown off-course by a scrappy 16-year-old local girl intent on reuniting with her little sister in the U.S. The Padre is directed by Canadian filmmaker Jonathan Sobol, director & writer of the films A Beginner's Guide to Endings and The Art of the Steal previously. The screenplay is written by Stephen Kunc. This hasn't premiered at any film festivals or otherwise. Vertical Entertainment will release Sobol's The Padre in select theaters + on VOD starting September 28th in the fall. Is anyone interested?